One of the most interesting observations from our Family Forest School has been watching the children’s developing relationship with Nature. Most of the children arrive with an interest in playing and exploring in the woods, the stream and the mud. Yet over the weeks, through the games and activities they learn more about the woodland and wildlife as a whole, living and interconnected ecosystem. We always remind one another about the Three Stands of Care in Forest School: caring for ourselves, each other and nature. And seeing how the children have taken this care of nature to heart has been nothing short of heartwarming. They don’t pick living leaves or snap branches from the trees, and remind each other to be careful, and that the trees are living. We crouch down on the ground, waterproofs rustling, and move the fallen leaves aside to look for the new tiny green leaves, are they dock leaves, Celendine or tiny new trees? The children are gentle, touching the new leaves softly, just like they do with so much wonder and excitement in spring when we go around the woods looking at the new amazingly magical leaf buds and then stroking the new soft fluffy Beech leaves, thinking this surly is where the fairies come to make their clothes. Looking for mini beasts has been fun too, at first some of the children weren’t so keen on spiders, and thought the woodlice were yucky! Yet after a few weeks of us talking about the woods as a big, living home to many creatures, and gentle, curious adventures and explorations, things started to shift. As part of their free play, children spent a very long time building houses for hedgehogs and other wildlife. We rolled over logs and they reminded each other to be very careful as this is the home of the woodlice. They talked about the woodlouse mummies, daddies, babies, and big brothers and sisters. They were incredibly gentle, interested and curious, and now remind each other to be careful and check for the creatures. This didn’t so much happen because I told them to do so, or gave them lots of facts about the mini beasts, but rather I think it unfolded this way as we talked about them being alive, we modeled the energy of gentleness, wonder, care and excitement. We were gentle turning over the logs, and then very quiet, and in hushed excited voices whispered ‘there, there, look! !’ when we saw one…. this energy carried over, much in the same way that we are calm and stable around the tools, and then energetic and excited when we run around, play games and explore. It seems that this is very much the way a ‘way of being’ is shared and transferred to children; rather than us telling them to do stuff, rather it is the energy we share, model and create and invite them into, the space we hold for them to experience rather than simply telling them what to do. The care, knowledge and gentleness the children show to these tiny living creatures is the embodiment of Empathy; Nature Empathy. They have understanding, care and connection to creatures so different from themselves, and they want to care for and protect these tiny beings. This is something very different to learning only intellectually about nature: there is an emotional, heart centered connection. And it is this connection, as well as intellectual understanding, which is so vital to the future care of our ecosystems. For if children care about nature and wildlife in their own hearts, then seeing pictures of Orangutans losing their habitat due to palm oil plantations, or sea turtles trapped and disfigured by plastic, washed up dead on the shores is going to resonate with them personally, causing them to want to make any changes they can to help these creatures. This Nature Empathy carries over into daily life. 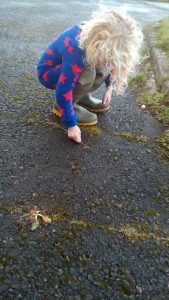 We can’t go for walks without our little boy rescuing worms stranded on the path and putting them gently onto the grass. Rather than just learning about Nature, we can help our children to learn to love nature. For it is this love coupled with understanding which makes them really care and want to love and protect the creatures and trees around them. 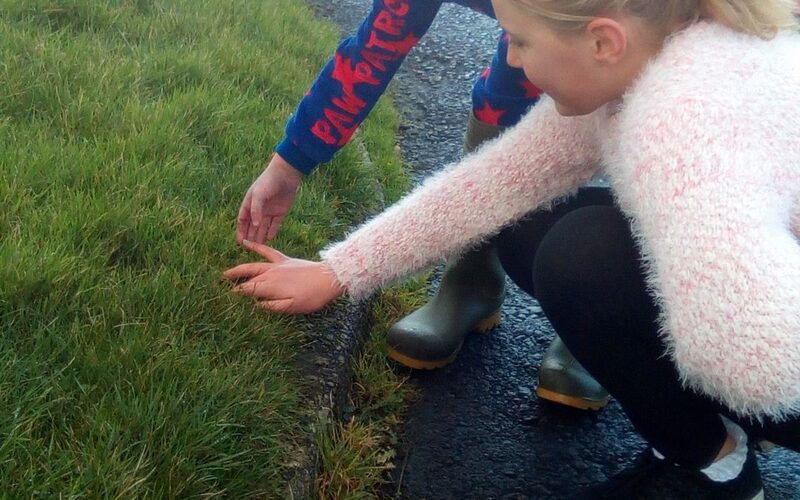 Get out as often as you can and in all weathers, look for the signs of wildlife around you, turn over logs and see the centipedes and woodlice scurrying around. Talk about how the mini beasts nibble through the leaves and return the goodness back to the soil, how the birds and hedgehogs need the insects, and how the trees are home to everyone. Look for signs of woodpeckers making holes in the trees, and look for nests, birds eggs and ladybirds and be curious, gentle and excited yourself and pass this empathic energy on to your children. Build habitat piles from logs and sticks, collect litter out on walks, and most importantly take time to look, learn about and love the natural life which lives alongside us. Of course this all takes time, but it is time well spent; local walks and explorations of woodland, beach and parks gets us out of the house, we get fresh air, we walk and move our bodies, we become more connected to our local landscapes, we develop a relationship with them as well as learning more, and so we begin to care more for our local nature, and therefore want to care for it more. Take a bin bag and do a local litter pick sometimes, or do so at the beach, its amazing how much litter is there at this time of year when the hedgerows and grasses have died back. Interestingly, play, imagination and creativity also stimulates the side of the brain which holds the centre for our capacity for empathy (there’s a great article about this here)~ therefore plenty of time for play, exploring and being in nature works twofold; it gives our children a grounding in the natural world and experiences of exploring, loving and caring for it, and at the same time such play helps to stimulate brain development which nurtures their capacity to feel empathy. This is a fascinating link and shows the real potential of the Forest School process as well as the great value of being with our children outdoors as part of family life. We’d love to hear about your experiences. This is such an interesting and thoughtful exploration. Thanks for sharing it.